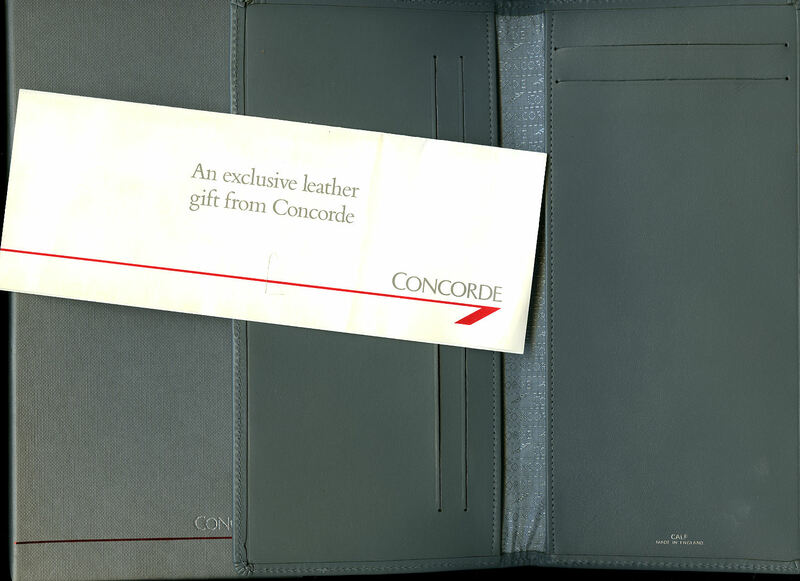 British Airways Vintage Concorde In-Flight Memorabilia - Ephemera | Grey Leather Cheque Book Holder for UK and USA Cheques. Grey leather cheque book holder for UK and USA cheques. 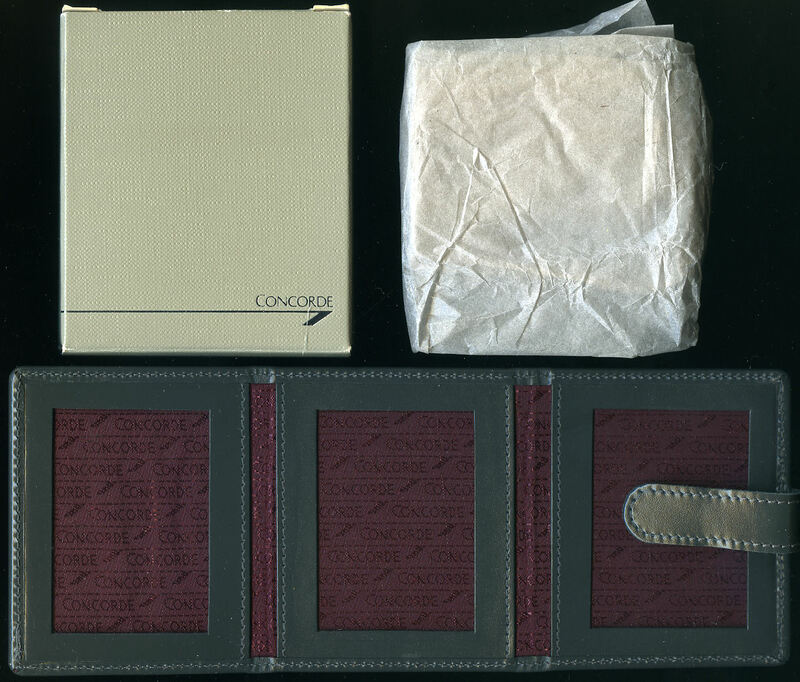 The short pocket accepts the back cover of a British cheque book, the long pocket accepts the back cover of an American cheque book, silver Concorde lined, note of authenticity loosely enclosed, complete in presentation box. In Fine condition. Member of the P.B.F.A. 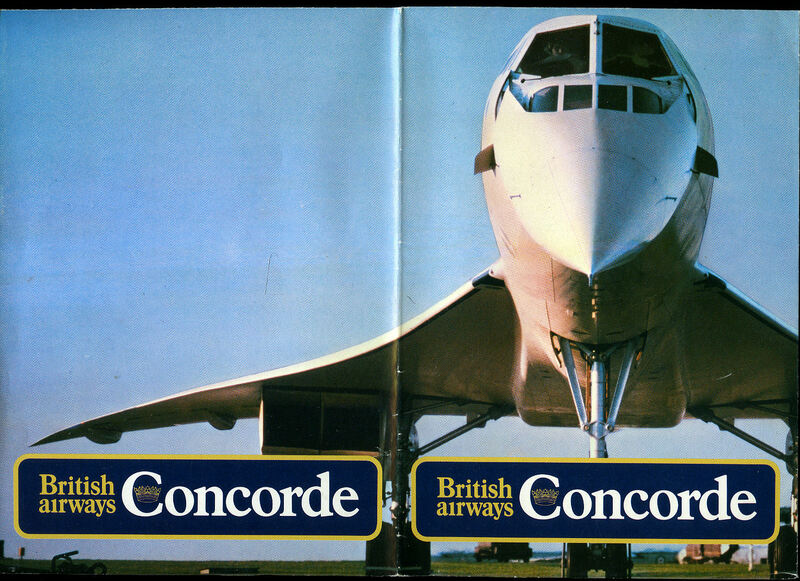 British Airways Vintage Concorde In-Flight Memorabilia - Ephemera | Concorde Poster and Facts Booklet. 16½'' x 23½'' folding facts booklet to one side, Concorde poster to the reverse. In Fine condition. Member of the P.B.F.A. British Airways Vintage Concorde In-Flight Memorabilia - Ephemera | British Airways Concorde Menu New York - London 1978. (BA 172 Con. A 29878). 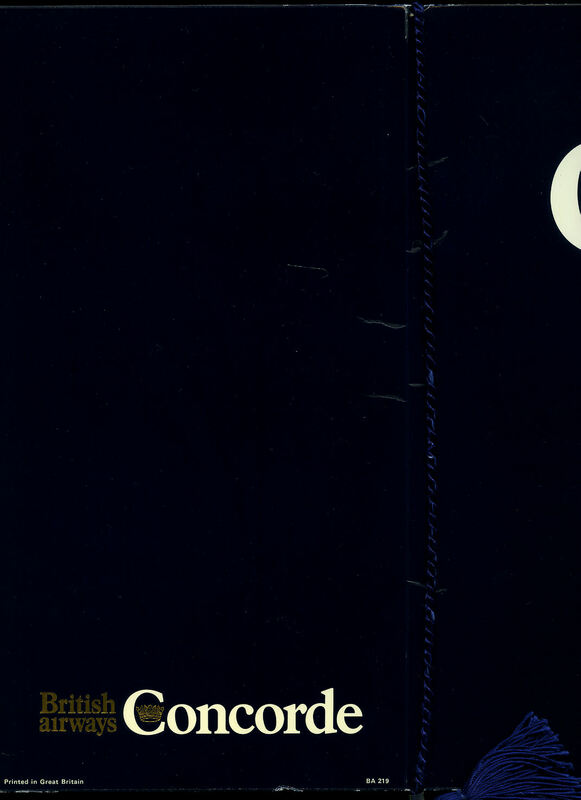 11½'' x 6'' Concorde menu in glossy navy card wrap covers, lanyard and silk tassel. Minor creases to the left hand edge and in Very Good clean condition. Member of the P.B.F.A. British Airways Vintage Concorde In-Flight Memorabilia - Ephemera | Grey Leather Note Book with Pencil. Issued in flight only to passengers on London | New York and Washington routes in the 1980's. 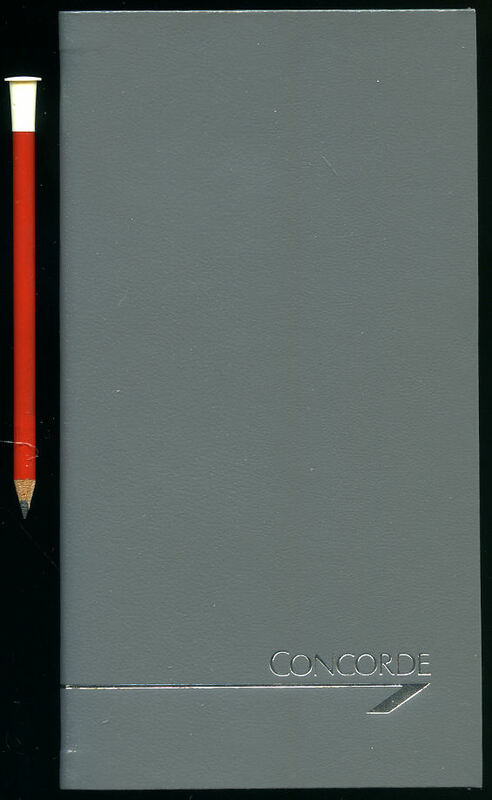 Grey leather note book and pencil. In Fine condition. Member of the P.B.F.A. British Airways Vintage Concorde In-Flight Memorabilia - Ephemera | Concorde Dinner Menu Washington - London March 1992. 11½'' x 6¾'' Concorde Dinner menu in stapled white card wrap covers with stylised Concorde logo in silver to the front. Separate menu inside with Bar Service to the right hand side and Dinner Menu to the left. In Fine condition. Member of the P.B.F.A. British Airways Vintage Concorde In-Flight Memorabilia - Ephemera | British Airways Concorde White Onboard Passenger Information Folder Booklet. 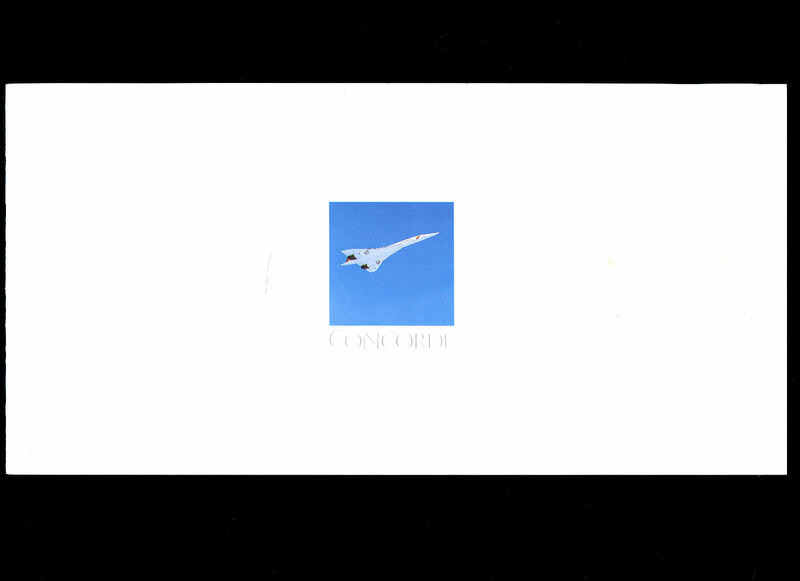 Landscape 6'' x 11½'' Concorde white onboard passenger information folder booklet, embossed Concorde logo to the front cover, contains 16 pages (+ covers) text with colour photographs throughout. In Fine condition. Member of the P.B.F.A. 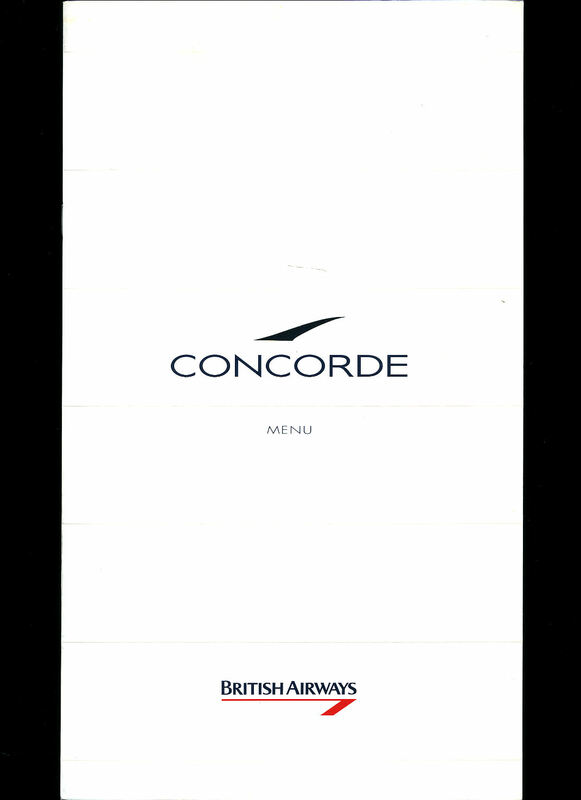 11½'' x 6'' Concorde menu in glossy colour illustrated card wrap covers. Inside is a separate double page menu, left hand page describes Bar Service listings for Aperitifs, Cocktails, Soft Drinks, Beers, liqueurs. The right hand side has the Dinner Menu in French with English explanation. Minor creases to the left hand edge and in Very Good clean condition. Member of the P.B.F.A. 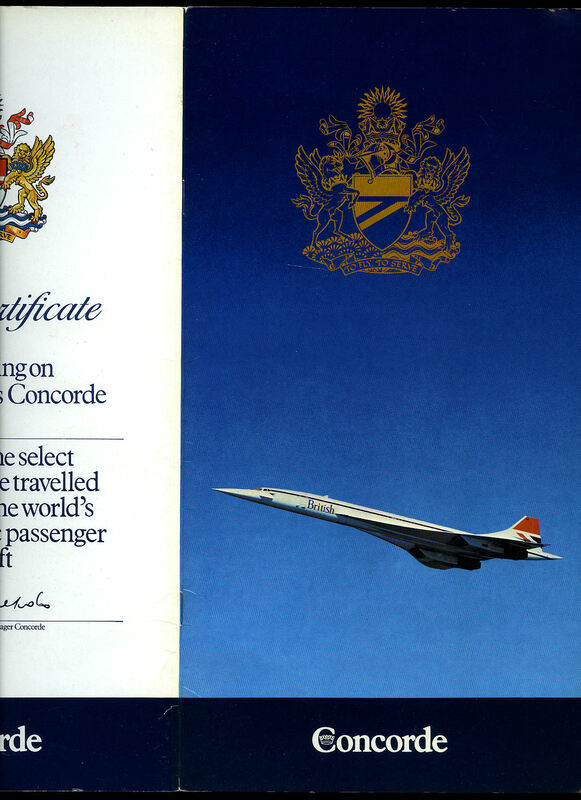 British Airways Vintage Concorde In-Flight Memorabilia - Ephemera | Authentic Concorde Flight Certificate (Supersonically) Lord King and Sir Colin Marshall. Marble grey card 11½'' x 8¼''. 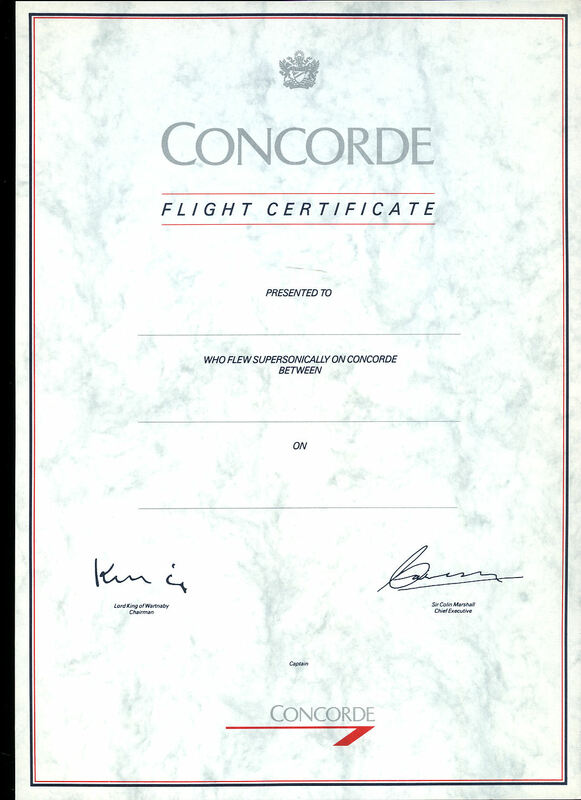 Unused Authentic Concorde Flight Certificate (Supersonically) Lord King and Sir Colin Marshall. In Fine condition. Member of the P.B.F.A. 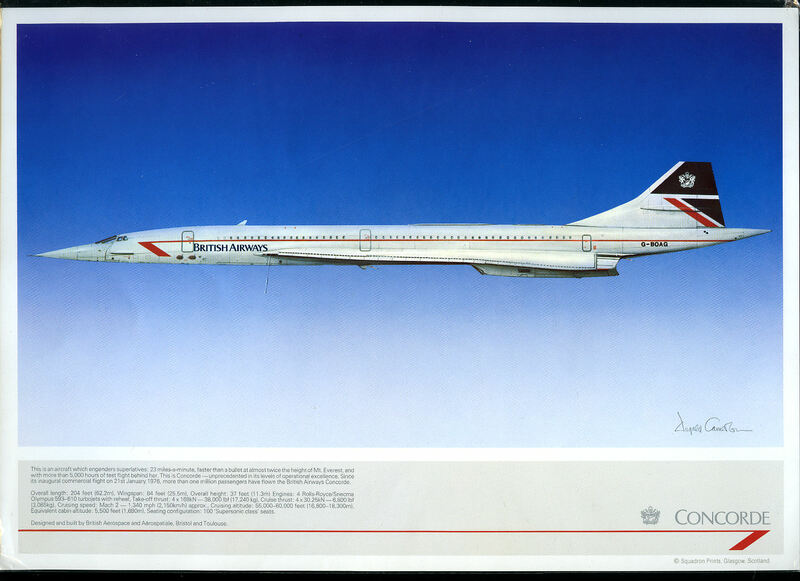 British Airways Vintage Concorde In-Flight Memorabilia - Ephemera | Dugald Cameron Colour Print of Concorde | British Airways Concorde Passenger Gift Print Still Sealed. Landscape 8¼'' x 11½'' colour print by Dugald Cameron. In original sealed plastic wrapper. In Fine condition. Member of the P.B.F.A. British Airways Vintage Concorde In-Flight Memorabilia - Ephemera | Early Concorde Swizzle Stick and Matches. Early Concorde swizzle stick and matches. In Fine condition. Member of the P.B.F.A. British Airways Vintage Concorde In-Flight Memorabilia - Ephemera | Cross Ball Point Pen and Pencil Set with Original Warranty. 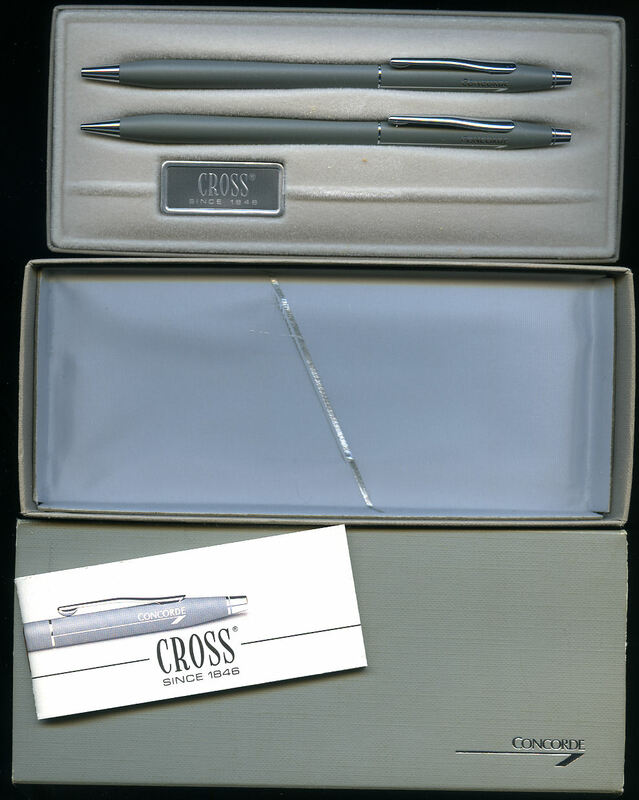 Cross Ball Point Pen and Pencil Set with Original Warranty, grey with Concorde logo in silver, in original presentation box and matching sleeve. In Fine condition. Member of the P.B.F.A. British Airways Vintage Concorde In-Flight Memorabilia - Ephemera | Concorde Embossed Stationery + Boarding Pass / Ticket Wallet + Silver Plastic Cabin Baggage Tags (M 199). Concorde embossed stationery of 3 envelopes, six A5 sheets in white card folder. Boarding Pass / Ticket Wallet. 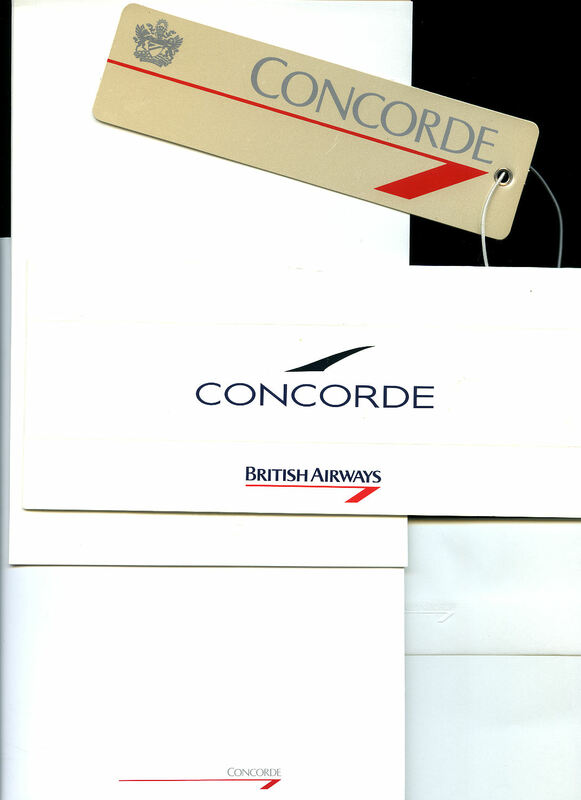 Silver plastic cabin baggage tags with Concorde logo to the front and space for name and flight number to the rear. All in Fine condition. Member of the P.B.F.A. British Airways Vintage Concorde In-Flight Memorabilia - Ephemera | Triptych Folding Dark Grey Leather Mini Photo Frame. Triptych folding dark grey leather mini photo frame, maroon silk Concorde motif lining. Complete in original box and tissue wrapping. In Fine condition Member of the P.B.F.A. 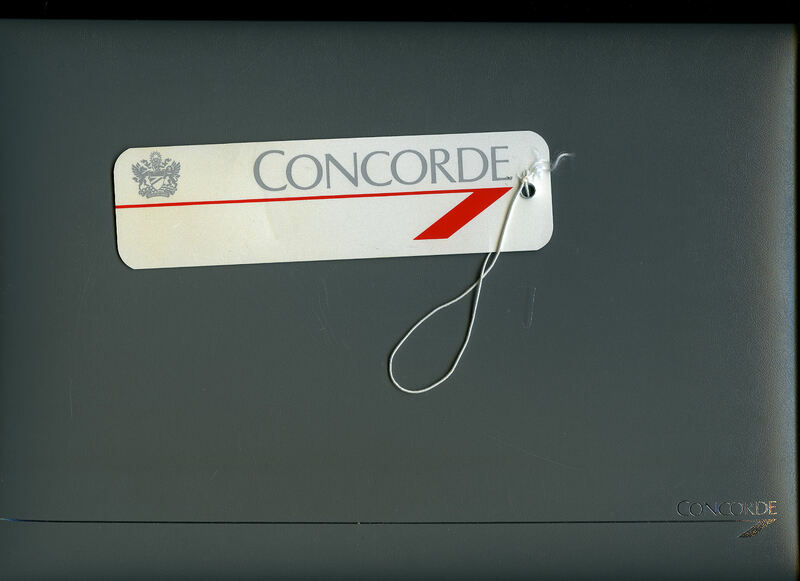 British Airways Vintage Concorde In-Flight Memorabilia - Ephemera | Concorde Grey Fibre Leather Look A4 Size Document Case + Silver Plastic Baggage Tag (M 239). Concorde grey fibre leather look A4 Size document case with Concorde logo in silver to the front, press stud closure to the rear. Silver Plastic Baggage Tag (M 239). In Fine condition. Member of the P.B.F.A.